I got a call from my bank's Fraud Detection department the other day. A friendly but serious fellow on the other end of the phone asked "Did you attempt to purchase a mattress online for $8800?" Uh, no. Who spends $8800 on a mattress? Online? So, it turns out my credit card had been compromised - whether skimmed at a restaurant I was at recently or my number was posted online somewhere, the fraud department wouldn't say. Regardless, I had to go through the song and dance of filing some paperwork and then waiting for my new credit card. I suppose this is just one of the hassles of 21st century life, but it definitely IS a hassle - to have your payment card skimmed. So that's why Petro-Canada has partnered with Toronto Crime Stoppers, the Canadian Crime Stoppers Association and Circle K Stores (formerly known as Mac's Convenience Stores) to guard against payment card skimming at our gas pumps. Payment card skimming is a serious problem across the petroleum industry. In addition to the covert security features already in place at Petro-Canada, we're adding a more visible feature as well: strategically placed silver holographic anti-skimming decals. These decals bear the Crime Stoppers logo and will be placed on all Petro-Canada and Circle-K gas pumps in the Greater Toronto area and across Canada. If fraudsters tamper with the strategically placed decals, they will break apart and visually alert customers and employees to a potential issue. So if you see that one of these decals has been broken, please alert our gas station attendants. They are instructed to perform preventative maintenance checks and ensure the integrity of the gas pump. 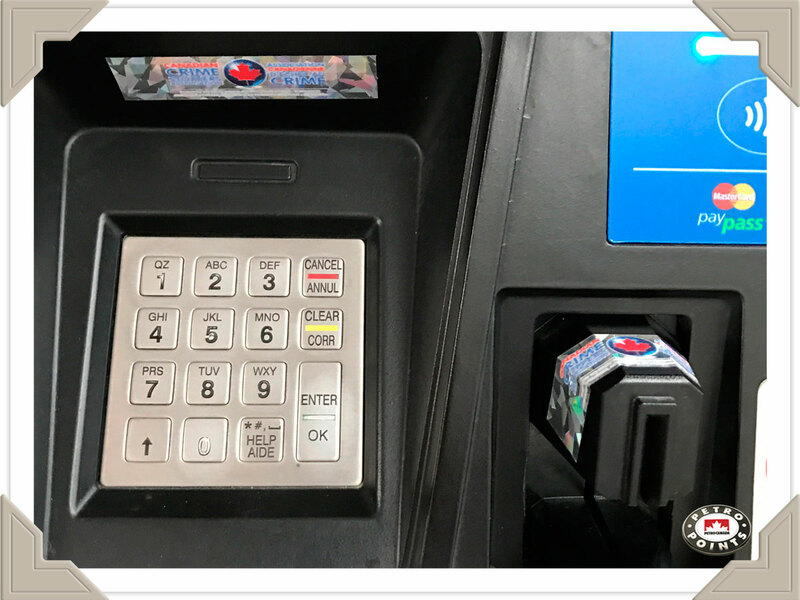 Crime Stoppers, in addition to supporting these decals, also encourages customers when paying at any gas pump to ensure that the card reader is secure by pulling on it and to check that the keypad area is flush against the console and not loose. We're very excited about this initiative as well as working with Crime Stoppers, Circle-K and our customers to prevent skimming at the pump. Have you seen these anti-skimming decals at a Petro-Canada near you? Helping Drivers with Disabilities: I've seen, in the USA a system called 'FUEL CALL' it's a simple call button system for drivers that, due to their disability are not easily able to fill their tanks. With the cooperation of the station staff, the driver pulls up to a wheelchair logo designated pump, rolls their window down and pushes a big blue button, for pump assistance. The station staff comes out, fills the tank, takes the credit card and processes the purchase (and other items if requested) and returned the credit card and receipt to the driver. How come I don't see this available in Canada?